Born in 1969 in Seville to a prestigious flamenco family boasting a long line of legendary performers, Dorantes absorbed the roots of flamenco at home. He also studied piano at the Real Conservatorio Superior de Música of Seville from a very young age. Consequently, he has always searched for a synthesis of traditional flamenco, classical and avant-garde music. 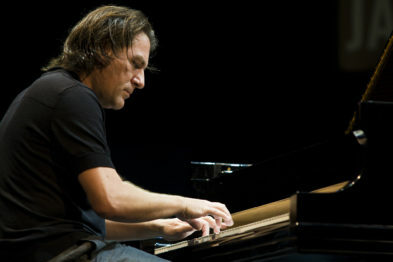 Scrupulous about technique, innovative in the composition and perfect in the execution, Dorantes’ approach has led to him becoming an important name in the word of flamenco piano, forging a new path in piano history; a voice nurtured by Spanish flamenco and yet all his own. He is the winner of multiple awards, including most recently the 2012 Girandillo award for the best music for Contrabass (Renaud Garcia-Fons) and the 2014 Joaquín Master of the Order of Performing Arts in Andalusia.